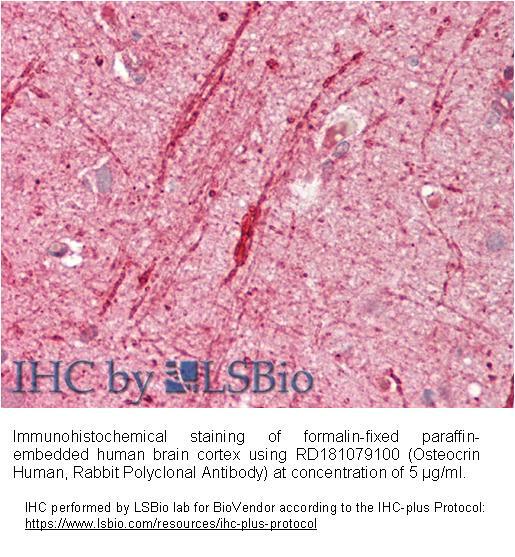 The antibody was raised in rabbits by immunization with the recombinant Human Osteocrin. The immunization antigen (13.6 kDa) is a protein containing 122 AA of recombinant Human Osteocrin. N-Terminal His-tag 16 AA (highlighted). Affinity chromatography on a column with immobilized recombinant Human Osteocrin. 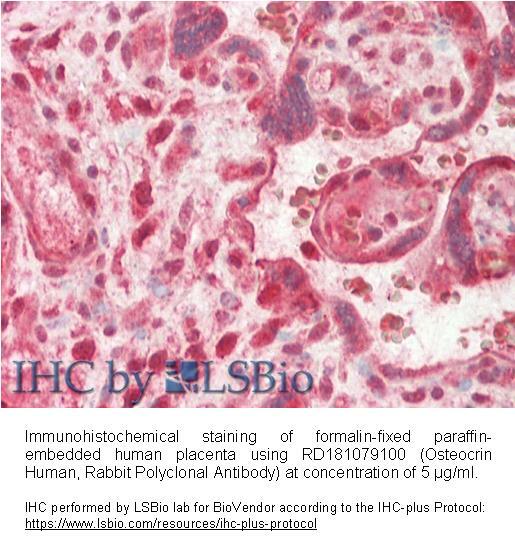 Osteocrin is a recently identified secreted protein expression of which was only detected in bone, peaking just after birth and decreasing markedly with age. A 1280-bp mRNA encodes osteocrin producing a mature protein of 103 amino acids with a molecular mass of 11.4 kDa. In primary osteoblastic cell cultures osteocrin expression coincided with matrix formation then decreased in very mature cultures. Treatment of cultures with 1,25-dihydroxyvitamin D3 resulted in a rapid dose-dependent down-regulation of osteocrin expression, suggesting direct regulation. Chronic treatment of primary cultures with osteocrin-conditioned media inhibited mineralization and reduced osteocalcin and alkaline phosphatase expression. These results suggest that osteocrin represents a novel, unique vitamin D-regulated bone-specific protein that appears to act as a soluble osteoblast regulator.